Out of all the classes I run, by far my favorite is 1/16th Scale Unlimited Hydro. 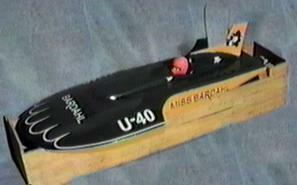 It's the class that got me started in Fast Electric Model Boating over 10 years ago. In return, the 1/16th scale class has been good to me. I've won several National Championships and set several oval and straight line records. I've also had the opportunity to design or develop hulls for 2 different manufacturers. Finally, I believe that the 1/16th scale has one of the best power to weight ratio of any of the Fast Electric model boat classes. Because this is a very High performance boat I place a very high emphasis on quality hardware and fasteners. I make my own hardware for this boat, but Fuller's Fast Electrics has excellent pre-made hardware. The Maus hull is very durable, however there are a few places I feel need some reinforcing. This is not unique to the Maus hull, I highly recommend the following procedures for all 1/16th scale hydros. There are 3 main areas I am concerned with. 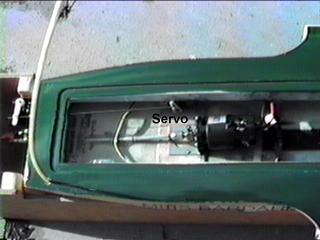 The transom, back of the right sponson and underneath the motor. I have epoxied in pieces of 1/8th inch plywood in each of these areas to stiffen them up. You can see the piece under the motor mount in the picture to the right. 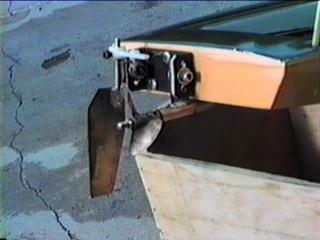 The sponsons on the Maus have a very flat angle of attack (it's why it handles so well). 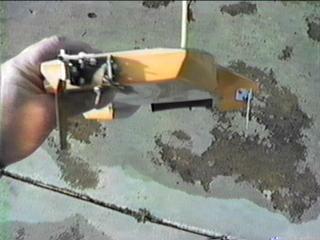 Because of this it is important to move the strut (the thing that holds the prop shaft) up as high as possible. This is known as strut depth. Mine actually touches the hull at the nose piece. The angle of the strut is even more critical. This is what makes the boat run like a prop riding hydroplane. You will probably want some positive angle in the strut around 1-3 degrees (positive angle is when the back of the strut is lower than the front) Too much positive angle and the transom of the boat will bounce violently on it's tail. Too little positive angle and the back of the boat won't get off of the water. This dragging around the pond is hard on equipment. 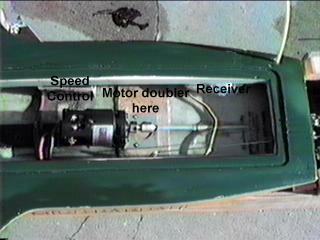 The motor can't unwind so it overheats and eventually will fail, plus the boat will be dog slow. I always error with a little too much positive angle, it helps the boat get through the corners faster. See the photo to the right. Very important! If your going to overdo an area, make it the skid fin and bracket. The stiffer the better. The depth of my skid fin is 1 1/2 inches measured from the bottom of the sponson. The overall dimensions are 2 inches tall by 1 7/8 wide at bottom. Make sure your skid fin runs parallel with inside edge of the sponson. It should also be angled in at the bottom about 5 to 7 degrees. See photo to the left. 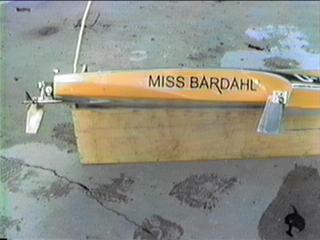 Rudder depth is 2 inches and is located 1 1/2 inches to the left of the strut. Mine is positioned fairly neutral. This should get you close. Now go dial it in and watch it scream. It may be a little tricky at first. Getting the strut angle just right takes a little practice. As I mentioned above I use the Ultra 920-4 or Plettenburg 290/20 4 turn (they're both basically the same motor). For this boat they seem to work the best. I know there are many other great power sources out there. If you come upon something hotter, let me know. I also think running an FM transmitter is wise for this boat. Because of the proximity of the electronics and high amp draw on 8 cells you may experience radio problems with AM units, particularly on 75 band. I have no trouble at all with the Hitec Lynx FM. Most of the members in our club are now using it with perfect results. Best of all it's priced about the same as other manufacturers AM units. I tried to put this together for the average model boater. If your not sure about certain steps or think you need more information, please e-mail me. Good Luck!